The tiny office in my apartment has been the bain of my existence since we moved in. Its ALWAYS a mess and its right off of the family room and of course in my direct line of vision daily. 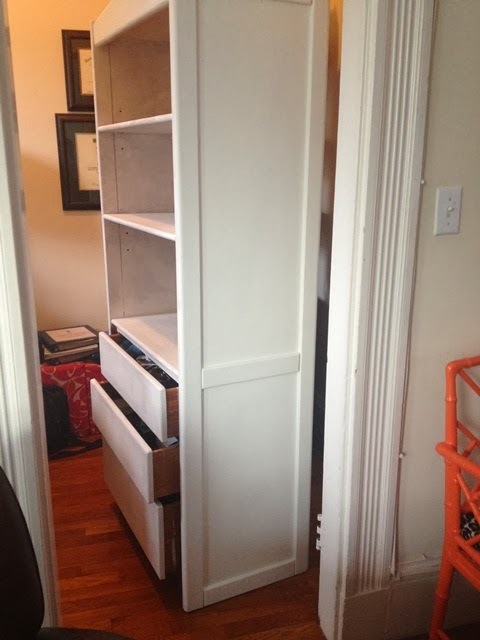 Anywoo, I'll do a whole office post later, this post is more about the Annie Sloan chalk paint that transformed the bookcases I was about to throw to the curb. Originally I bought them for a song, with grand plans of painting them white. But then months and years passed and they sat creeping up the office and making it feel smaller and darker than it is. They sat so long because I realized how much of a job it was going to be to sand them, prime them, then paint them. Yuck. 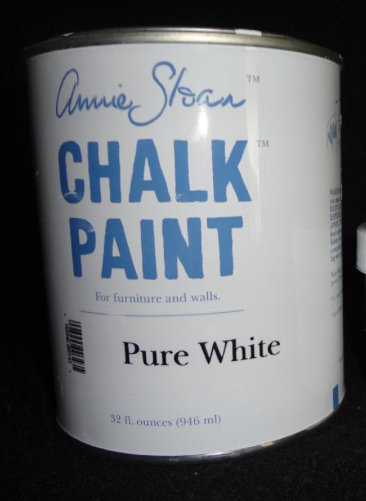 Enter Annie Sloan chalk paint and their promise that it requires ZERO priming. I had held off so long because of the price tag, its kind of steep. I also want them in a high gloss finish, not that chalky finish. But the thought of spending so much time sanding them and the fact that with the wax I could polish it to a shine sold me. I bit the bullet and bought a can of Pure White Annie Sloan Chalk Paint and a can of the clear wax. Now I did wipe down both the bookcases with a vinegar and water mix to clean off any grossness that was one them, and then I went to town. *So a little word of advice, if you want to paint something dark brown like these bookcases order a can of Old White AND Pure White. Yes its more expensive, but I ended up using 2 full cans of Pure White on these. I learned the hard way the Pure White has no pigment and it doesn't cover like the other colors. I wish I would have ordered the Old White as well because then I would have more than half of two cans left instead of nothing left. The painting was the easy part. It goes on quick and dries faster than any paint I've used before. The hard part was the wax. I had no idea it would require so much buffing. I did two coats of the wax and buffed every single inch of those bookcases like nobody's business. I wanted shine and shine they do. It doesn't even look like that chalky finish I was afraid of. Now since these obviously get a lot of wear and tear I wanted to make sure they were good and cured before I put anything back on them. I let them sit like you see above for a good 3 weeks before I put anything back. I'm really glad I did, because the finish has not scratched once yet. I love them and they look so great with the Pure White! I've got a few more projects to finish up in the office and then I'll share. What a great transformation. Was it very smelly? I need to do some inside painting and this looks a great option. Thanks for the tutorial! How do think it worked with no priming? A Pearl In The Making, The chalk paint was not smelly at all, didnt smell like anything actually. But the wax was a bit stinky- So do it with windows open if you use the wax part. I'm not sure what the VoCs are in that but they I'm sure they aren't low. I've been itching to try that chalk paint! Can't wait to see it all come together! I am dying to try chalk paint, and thanks for the tips. I think they look fabulous! Well worth the wait and I love the hardware! I used the same ones in my laundry room. I just bought some Paloma for a project and everyone thought I was nuts. The piece I want to paint is vintage piece with a marble top but modern in design. My style and taste is far from the shabby chic that is typical to AS chalk paint. The lack of sanding and priming is the reason I purchased the paint because there is no way I could move the thing. Anyway- did you use the AS brush or another kind to apply the paint? I was going to try a small foam roller to achieve the smoothest finish possible. Suggestions? Thank you for the comment about the white. I had an idea to use the white on a dark surface if the original project went well. MUCH better painted! 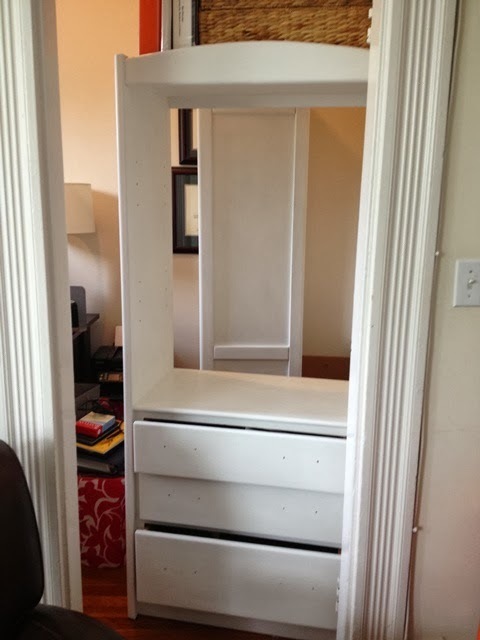 I've never done this with furniture, but would love to try. BTW, I am hosting a great giveaway this week on my blog for Jan Shower's new interior design hardcover book, Glamorous Retreats. 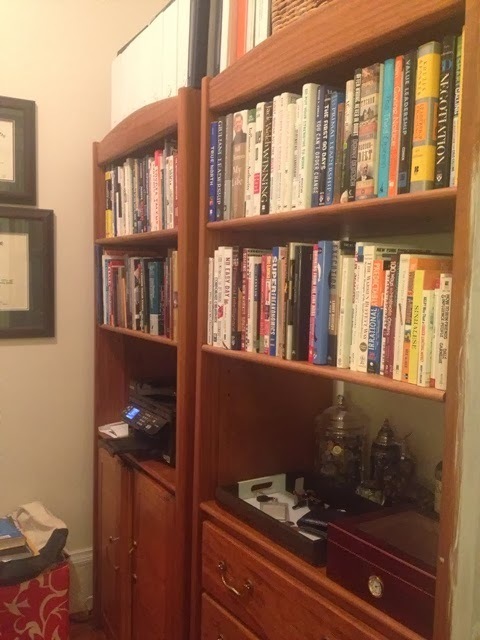 I'd like to invite you to stop over and enter! looks great in white! you are so good to wait 3 weeks- I would have been filling up the shelves the next day! Happily white ever after! Love it and cannot wait to see your reveal. I want to paint my kitchen cabinets badly - but HATE the look of brush strokes in paint. How did this paint perform using a brush? Would this paint brand hold up in a kitchen? Hi Cindy, I dont know about using this paint i the kitchen, you would have to check the actual retailers of the chalk paint to ask them that- sorry I dont know more!